Karen and Natalie Keane are sisters and founders of Bean and Goose. 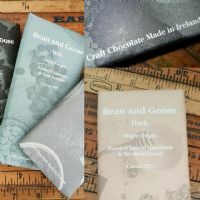 They make their chocolate at Last Tree Farm in the Wexford countryside. Some of their earliest childhood memories involve chocolate. To them, chocolate signifies good times, memories of growing up, our family and our holidays back home in Wexford. They began making chocolate using the traditional technique of hand tempering on marble slabs.